Use it to purchase cheap items whenever you want, bypassing our normal minimum checkout price. Allows you to transfer some money to a friend's account as a gift certificate. 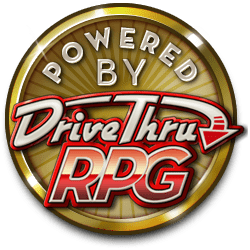 Help your pal overseas bypass any large transaction fee by directly sending them money to use at DriveThru, RPGNow and WargameVault. For more information, see our Gift Certificate FAQ. This title was added to our catalog on December 01, 2004.